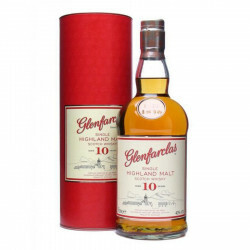 A careful selection of the best ingredients matching traditional distillation techniques enabled Glenfarclas to create a 10 Year-Old Single Malt of rare depth, a complexity that we normally find in older whiskies. Glenfarclas 10 Years Old is a beautiful combination of round creaminess, malty biscuits with flavours of peat and flowery notes. Light, delicate and velvety, it is a sophisticated, quite satisfactory Speyside Single Malt. 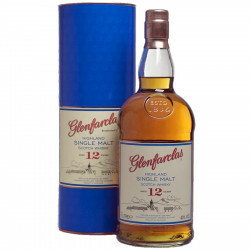 Nose: full-bodied and malty, with a sherried sweetness and delicate undertones of smokes and mild spices. Warming the glass unleashes honey and vanilla flavours. A typically firm body. Palate: dry at first, develops quickly on a large palette of tastes and flavours, with a combination of malt joined by the sweetness of Sherry. Flavoursome dried fruits, vanilla, cinnamon and cloves are then released for a lovely mouthfeel. Finish: of amazing length, silky and spicy, with tasteful, delicate and lasting smoky flavours.